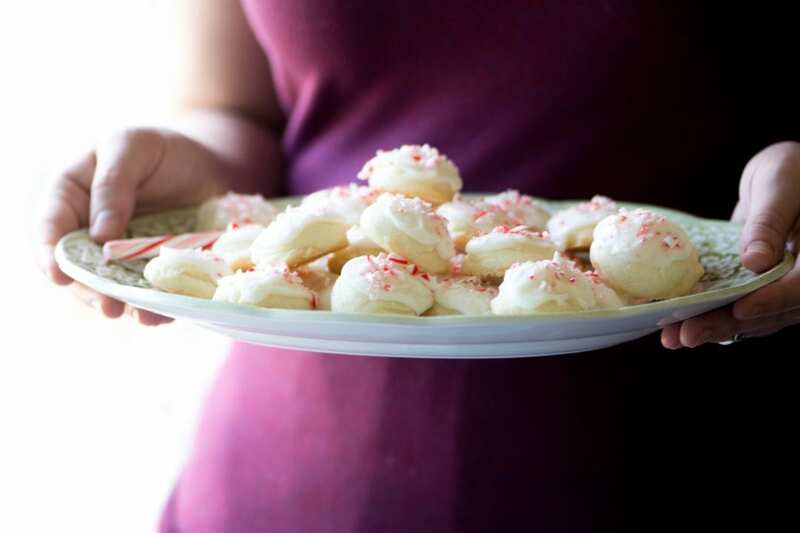 Peppermint Melting Moments ~ these are simple buttery shortbread cookies with a snow cap of minty frosting and a dusting of crushed candy canes, they’re cute as buttons, and I can’t imagine the holidays without them. MELTING MOMENTS are little bites of bliss that really do melt in your mouth ~ we’ve been making them in our family for as long as I can remember. The originals are pure vanilla, dusted with chocolate shavings, but I’ve been busy coming up with variations over the years. 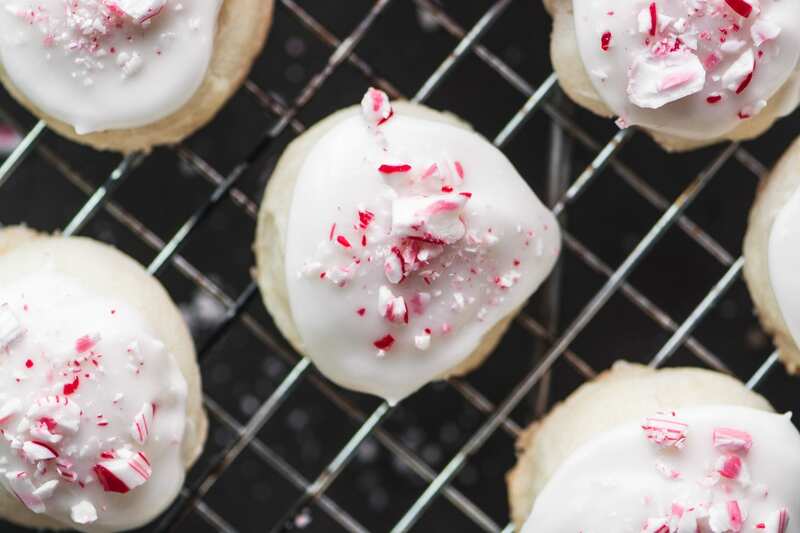 Normally I’m not a huge peppermint fan, but it’s one of those flavors that marks the season and I always make sure to use it in a few recipes throughout the holidays. It’s part of the whole sense-memory thing that happens this time of year. Like the scent of pine, a taste of peppermint brings my holiday memories flooding back. 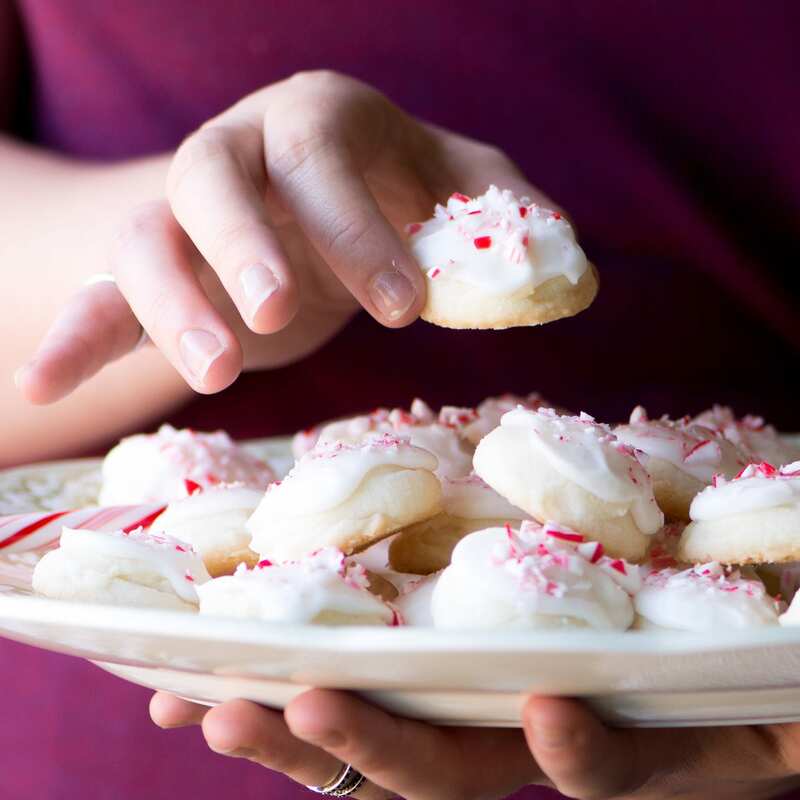 TIP: These little cookies make a really nice after dinner treat to set out on the table, the peppermint is light and bright and acts as a refreshing palate cleanser. This easy vintage recipe’s been handed down through the generations in our family. My mom taught my sisters and I, and now we’re teaching our kids. What’s fun about Melting Moments is their unique texture ~they fall apart and melt in your mouth. Chewing doesn’t really come into play with these cookies, and if you’re not used to the unusual mouthfeel it might take you by surprise. The texture comes from the cornstarch in the dough, which makes them super tender, unlike traditional chewy or crunchy cookies. When you replace some of the flour with cornstarch you reduce the gluten in the dough, and the cookies become light as a feather. 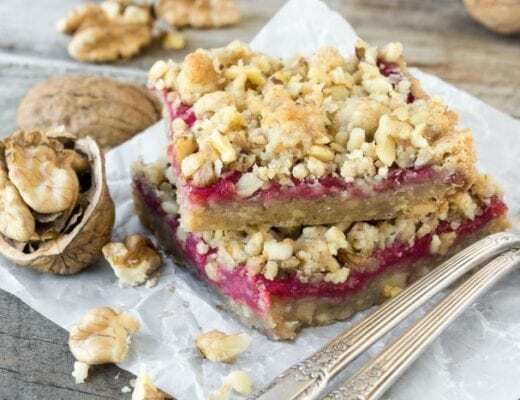 TIP: Buy good quality extracts for your holiday baking, the good stuff is really so much better tasting. Look for the words ‘natural’, ‘pure’, and ‘extract’ on the labels, and avoid anything artificial or imitation. MELTING MOMENTS ~ the originals! 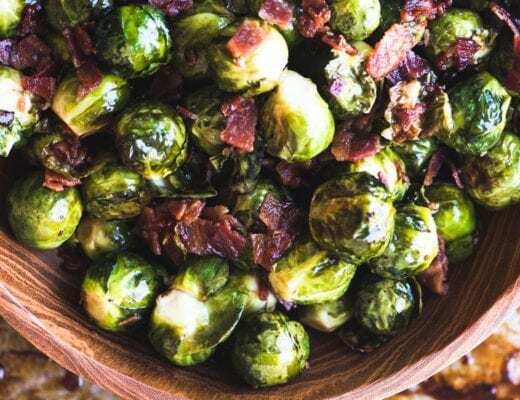 There are so many ways to change out this simple recipe, let me know if you experiment! Beat softened butter and sugar together until fluffy. Beat in the extract. Add the cornstarch and flour and mix until everything is well combined and the dough comes together without any dry crumbles. Put a layer of plastic wrap over the dough and chill for at least 2 hours. Preheat the oven to 350F Line a baking sheet with parchment paper or a silicone mat. Use a small 1 inch scoop to scoop out the dough and place 2 inches apart on the cookie sheet. Bake for 12 minutes. They will still look pale. Cool on the pan for 10 minutes, then transfer to a rack, carefully, they are delicate! Whisk the sugar and extract with enough milk or cream to make a spreadable frosting. Keep whisking until all the sugar lumps are gone and the frosting is smooth. 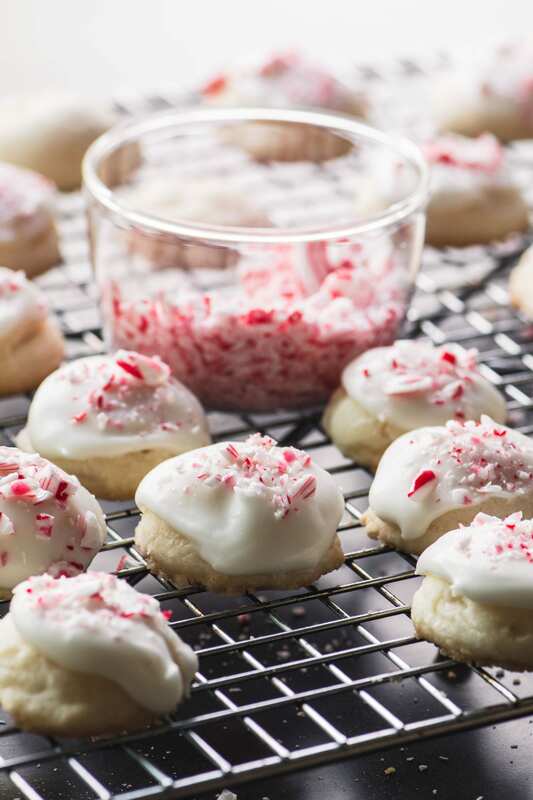 When the cookies are completely cool, top each with a dab of frosting and a sprinkle of crushed peppermint. 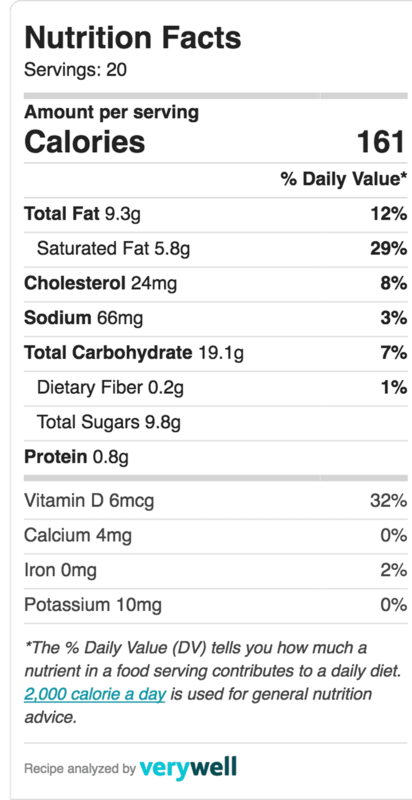 MAKE IT GLUTEN FREE: use a good gluten free baking mix as a substitute for the all purpose flour. You could add a small drop of red food coloring to the frosting to make it pink. I’m brand new to your site. Everything looks wonderful! Quick question: when measuring your flour, do you dip and sweep or spoon it into the cup – or something else? 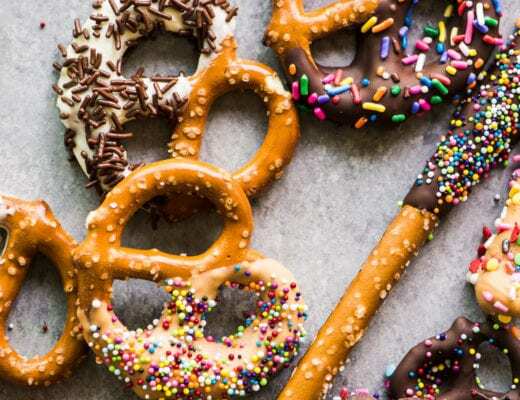 I have everything to make these cookies and want to give them a go. I fluff, scoop, and level Diane! I’ve never heard of melting moments… but little pillows of heaven!! So pretty too. These would make the sweetest little hostess gifts! Wishing you and your’s a beautiful Thanksgiving Sue! Absolutely perfect Christmas cookies! 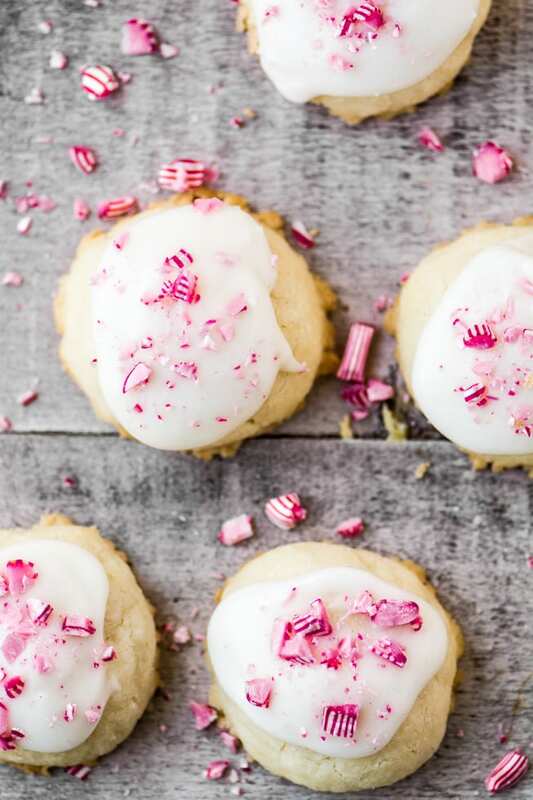 Love the peppermint with the buttery shortbread and so, so pretty! Glad to add one chocolate free cookie idea to my Christmas list. Thank you ! Good point, it’s always nice to vary the cookie selection around the holidays! 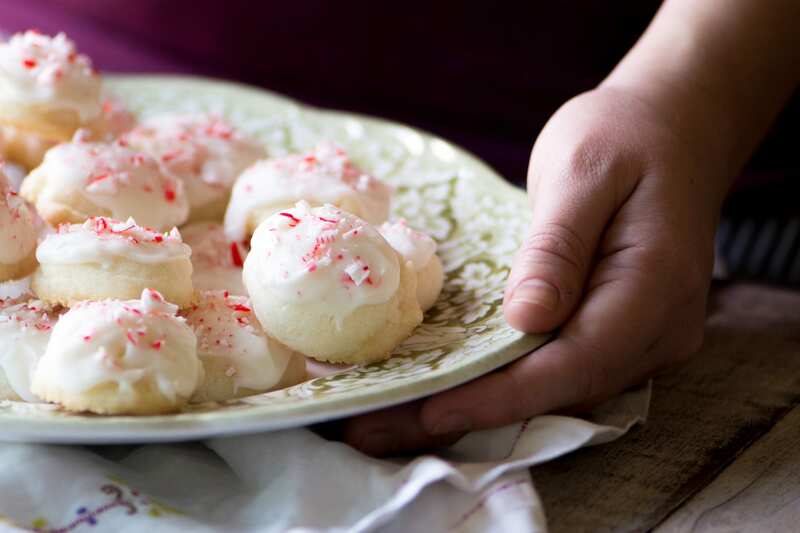 I adore anything peppermint and these look divine – can’t wait to make a batch! This my dream cookie! 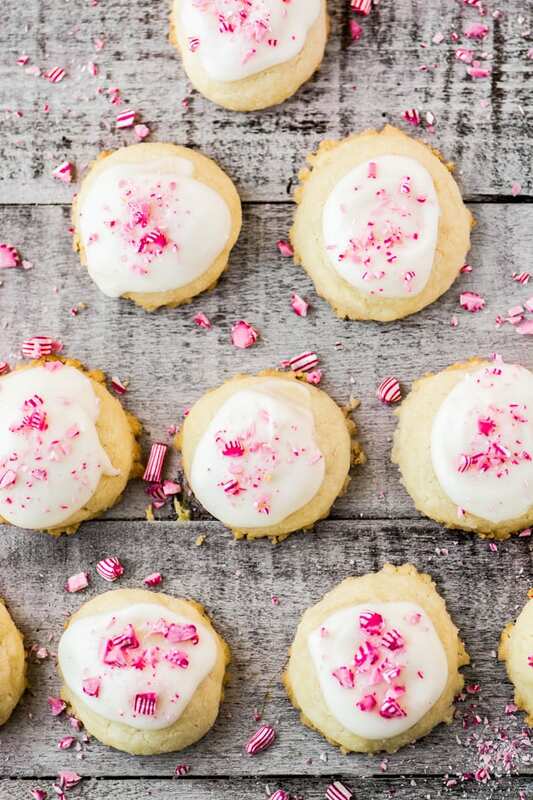 Melt in your mouth shortbread with a sweet peppermint icing. They’re beautiful too and I love your model! Thanks Chris! You remind me that one of my Aunts used to call these ‘Sweet Dreams’! So adorable, festive and beautiful…now pass the plate over, pleaaaaaaaaaaaaaaaaaaase?? The perfect Christmas cookie Sue! Snow capped and sprinkled with bright peppermint. I bet these really do melt in your mouth! My Christmas Cake and deco..along these lines:) The boys would love these.Thanks!